Among all the other benefits, Power Pressure Cooker XL will save you more time than you ever thought. Not only does it cut the cooking time in half, but Power Pressure Cooker XL will surprise you with its efficiency. Also, getting all the cooking conditions in order is no easy task, even for the best of the cooks. Thanks to the power pressure cooker technology, the conditions for different meals are pre-set. Therefore, the only action you need to take in regards to your cooking technique is press a button. The main thing you'll notice about this pressure cooker is a neat, modern design. Power Pressure Cooker XL has a digital display, which gives you absolute control. The pressure cooker infomercial shows the one-touch setting on the display, and it is just like that in reality. This pressure cooker has a sturdy, large lid arm handle, for easy and safe managing. The stainless steel housing is extremely easy to keep clean, with a single wipe. Power Pressure Cooker is, therefore, a durable, high-quality device. As for the Power Pres﻿﻿sure Cooker features, many of them receive much praise in the reviews. XL pressure cooker comes with brushed stainless steel housing. The cooking pot of this pressure cooker is removable, and non-stick coated, for effortless cleaning. At the top of the pressure cooker, you'll find a steam release valve. As for the digital display, it is mostly what makes the XL pressure cooker reviews so positive. You don't have to keep waiting next to the pressure cooker while you're preparing food. The 24-hour delay timer allows you to let go of all worries. Your pressure cooker will take care of the food for you. This 6-quart electric pressure cooker has 7 pre-set cooking modes. Thanks to this special feature, you will not have to decide the cooking conditions. With each of the cooking modes, there is a guarantee of success, no matter what kind of meal you are preparing. Simply, choose one of the one-touch preset buttons on the pressure cooker and start the process. Auto keep-warm mode takes even more weight off your shoulders. There are also 6 built-in safety features of this pressure cooker. An overall picture would be that Power Pressure Cooker XL does everything for you, from cooking, to protection. Flavor infusion technology is another great feature of this pressure cooker. It locks the steam inside, making your food even more delicious and tasty. TV pressure cooker delivers what it promises. 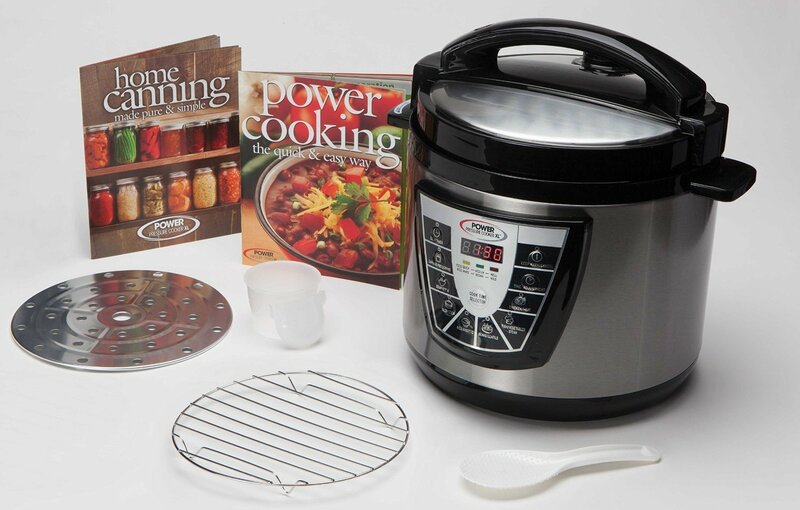 The reviews are true, and Power Pressure Cooker will be nothing but an asset to your kitchen. The dimensions of this pressure cooker are as follows: 12.5" x 14" x 12.5". Power Pressure Cooker XL weighs 9 pounds. Obviously, the pressure cooker will not take a lot of counter space. According to numerous positive reviews, this TV pressure cooker deserves all the praise it receives. Therefore, it wouldn't hurt to make some space for it. Power Pressure Cooker XL comes in two sizes. As far as the capacity of this pressure cooker is concerned, you can choose between the 6 quart one and the 8 quart one. The 6 quart pressure cooker, which is the topic of this particular review, holds 4 pt wide mouth jars. The capacity of this TV pressure cooker will be enough for everyday use, as well as the instances when canning more food, such as fruits. Most of the XL Pressure Cooker reviews showcase the versatility of this pressure cooker. If you're thinking about buying this pressure cooker, you're probably wondering what you can use it for. The truth is: pretty much anything that comes to your mind. The most interesting among all the possibilities is canning. Doing this kind of food preparation without a pressure cooker can be a nightmare. With Power Pressure Cooker XL, this is just another regular activity. Even if you have no interest in preserving your food, you can still do the regular cooking tasks with your XL pressure cooker. Equally as impressive will be the results in slow cooking, as well as steaming. It would be a shame not to try preparing a soup, or a stew, with your Power Pressure Cooker XL. Of course, don't hesitate to try it with different kinds of meat, or fish. Reviews state that vegetables and rice come out amazing, as well. Obviously, Power Pressure Cooker XL is not one of those kitchen supplie﻿s you'll rarely be using. Once you learn its benefits, you'll use it for everyday meals. Your XL pressure cooker comes with a few accessories you won't need to buy separately. First of all, you'll be getting a steamer tray. This tray will make it easier to place the vegetables or meat you want to steam. Steam can be difficult to work with, so this accessory will come in handy when you want to steam certain foods. A measuring cup and a ladel also belong in a package you receive with your pressure cooker. Finally, the user manual, which is also a canning guide, will accompany the cooker. This instruction manual will make it very simple to work with the device, and understand the process, especially with canning. As for the optional equipment, you can purchase the canning rack separately. How To Cook With A Pressure Cooker? Pressure cooking means placing all the ingredients into the same pot, making the flavors mix. The placement, as well as the cooking technology which uses steam, makes the taste unique. As explained before, you can prepare different kinds of food, whatever you prefer. Once you place all the ingredients into the pot, simply choose one of the pre-set programs. What Pressure Cooker To Buy? Depending on the capacity you want, choose between the 6 quart, and the 8 quart one. With Power Pressure Cooker XL you can't go wrong. Where Can I Buy A Pressure Cooker? If you're a fan of shopping in stores, you'll find this pressure cooker in stores such Bed, Bath & Beyond, Target, Macy's, etc. On the other hand, you can buy the pressure cooker online. Amazon is, without a doubt, the best place for online shopping. Therefore, you can buy the pressure cooker online, and possibly save some money. The Amazon rating of 4.1/5 stars is nowhere near disappointing. It most certainly speaks in favor of the popularity of this pressure cooker. The minority of the bad reviews you'll find on Amazon claim that the device didn't last them long. Others have complaints regarding the customer service. While the warranty indeed may not be satisfactory, take all reviews with a grain of salt. The overall impression will tell you if a device is worth a shot. Pressure cooking may be a newbie among the well-known cooking techniques, but it doesn't devaluate it. As a matter of fact, those on a road to a healthier diet will appreciate its versatility. While most of the questions have an answer in this review, one of them may be is it worth the money? It is definitely a matter of personal preference, before anything else. If you want a healthier diet, as well as to spend less time in your kitchen, it may be just what you need. On the other hand, if you don't feel that you wouldn't use it all that often, feel free to pass on it. Do you own a pressure cooker? What kind of meals do you like to prepare using it? Can Power Pressure Cooker XL replace your regular oven, or other top electric cookers? Feel free to share your thoughts in the comment section, especially the ones concerning the best pressure cooker on the market. I was charged $53.31 Plus the initial $10 and I haven’t even received my pressure cooker yet. I’m sorry to hear about that. You can connect on your Amazon account, go to your orders and track the shipping of your pressure cooker. If not, I advice you to contact the vendor through your Amazon inbox. You’ll receive for sure an answer and Amazon will have a copy of your exchanges. Let us know if you have further issues. Indeed, this is a good recipe idea. I will create another post with this recipe! As I was washing the kid to my power pressure cooker XL the small silicon gasket from the float valve came off and washed down the drain. How do I get extra gasket or two ?